My American Literature students are currently reading The Great Gatsby. Since we just started, I wanted to do a comprehension check, but I didn't want to give a pen-and-paper quiz, so I decided to try out something that I have heard other people in my department doing. The students' assignment was to create a visual representation of the main characters and events in chapter 2. 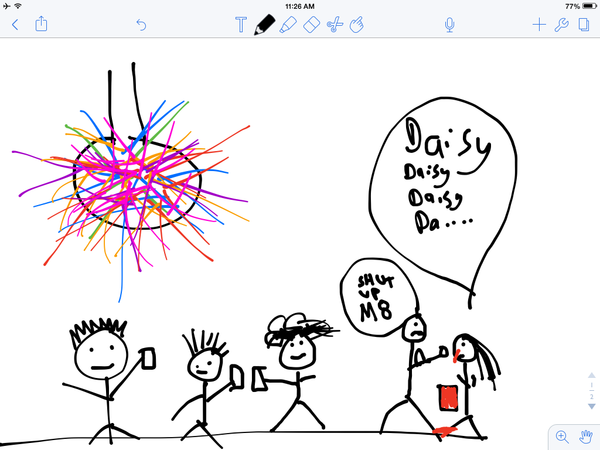 While I suggested apps like PicCollage or a comic book app, students were also free simply to use NoteTaker or Notability. I wasn't sure how this was going to go. There are a handful of students in this class who I could tell would scoff at an assignment like this, but I decided to see what would happen. The scoring was simply based on completion of the major events and characters, not creativity. Some students, as the one below, only produced one scene, which would receive a limited score, while others showed a progression throughout the whole chapter. In the end I was happy with how this assignment went. In a traditional class, we would have spent time talking about plot and characters to be sure students understood the key events. What this assignment did, however, was it required all students to take ownership of highlighting the key events and work through it on their own. I could hear them asking each other questions like, "Why did Tom hit her?" and "How do I know what Myrtle looks like?" or "Whose apartment was it?" I won't tell you that every student had so much fun, but there certainly was a higher level of engagement than if we were doing a large or even small group assignment for the same chapter. We will now use this foundation to instead spend time focusing on analysis of the literature than "did you understand." At the end of the period students uploaded their collage into a Schoology Media Album, so their peers were able to see it. I projected the album up on the screen and would refresh it to share progress. We started class the next day by looking at each collage. Again, this brought up more conversation. Some students asked, "Why do people keep putting a picture of a car or garage," which let us talk about George Wilson and his situation, etc. 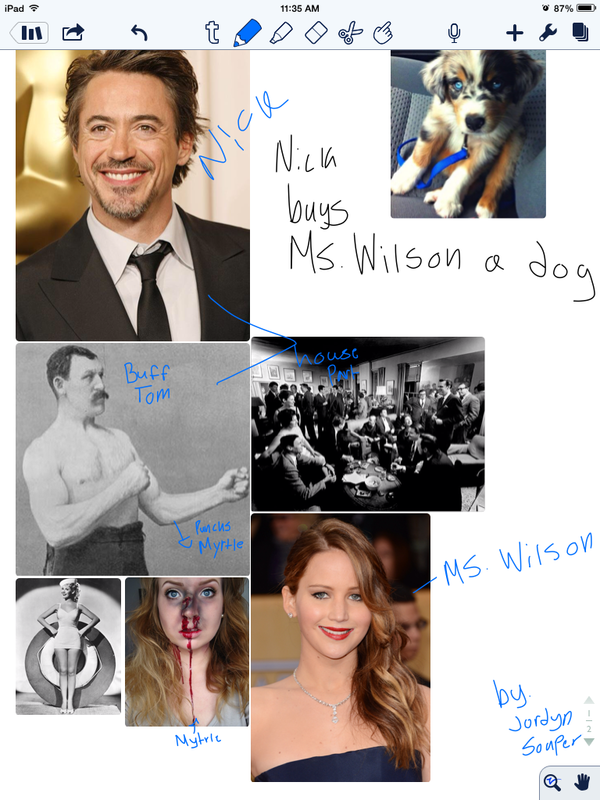 It also let us correct some misreading such as in the first collage above where the student said "Nick bought Myrtle a dog" instead of Tom. Overall, I was happy with the engagement and outcome of this assignment, and I look forward to working with it later on again in the novel on a more thematic level.